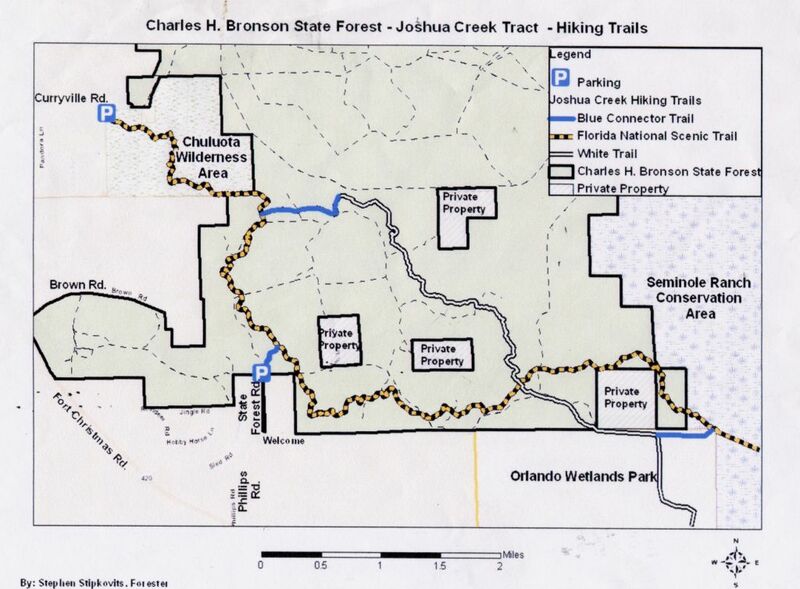 The Charles H. Bronson State Forest is a vast place to visit and an under-utilized gem for the sporting hiker/trailblazer, casual hiker, biker and equestrian. 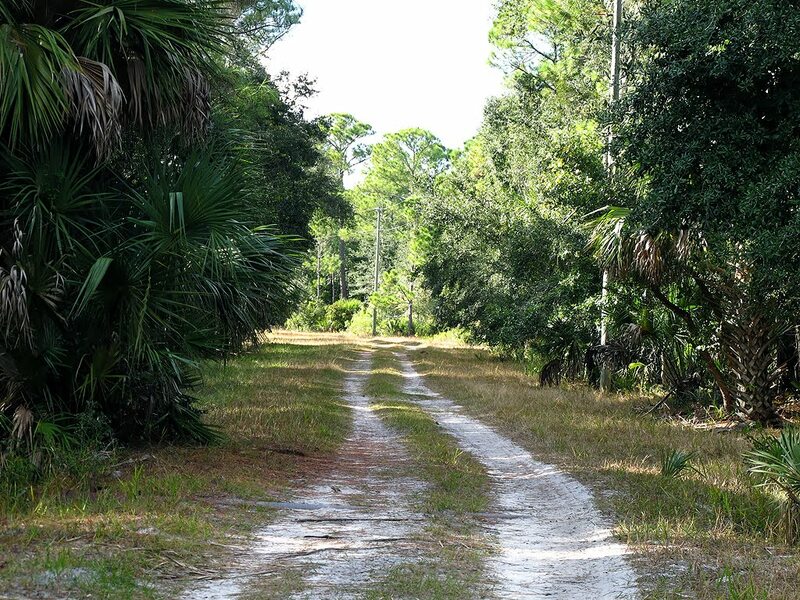 Its total landmass is 9,754 acres, with multiple access points, including the St Johns River. The main entrance is at the end of Phillips Road which is off N Christmas Road. 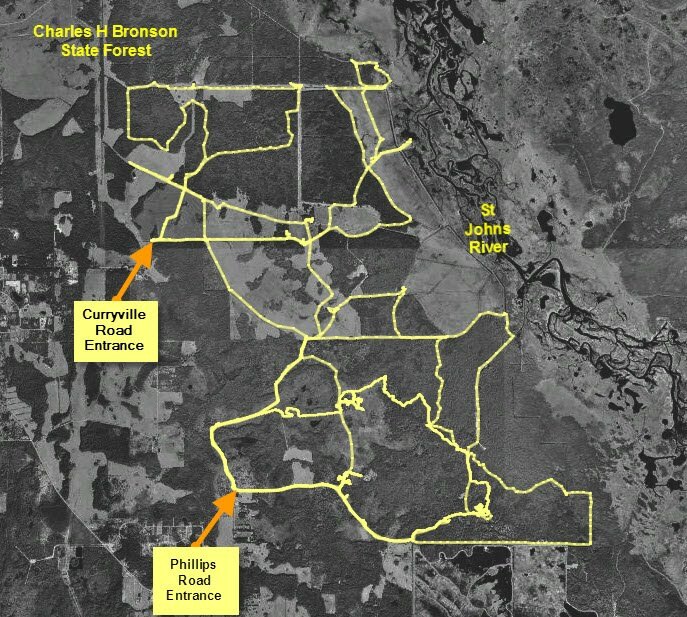 The land is under the control of the Division of Forestry, while hunting is controlled by the Florida Wildlife Commission. If you elect to enter the area from the Phillips Road parking area expect to pay a $2.00 entrance fee per person. The area is divided into three tracts: Joshua Creek Tract, Turkey Creek Tract and Clonts Tract. The whole area is crisscrossed with numbered and unnumbered roads. Hunters with a quota permit are allowed access to drive the numbered roads during hunting season. At the time of this writing, the land is being subleased to cattle ranchers, so a fair amount of cattle roam the land. I have hiked most of the area, both using the roads and also wandering around in the woods and pastures. The variety of objects and ecosystems you will encounter in this State Forest is truly amazing. 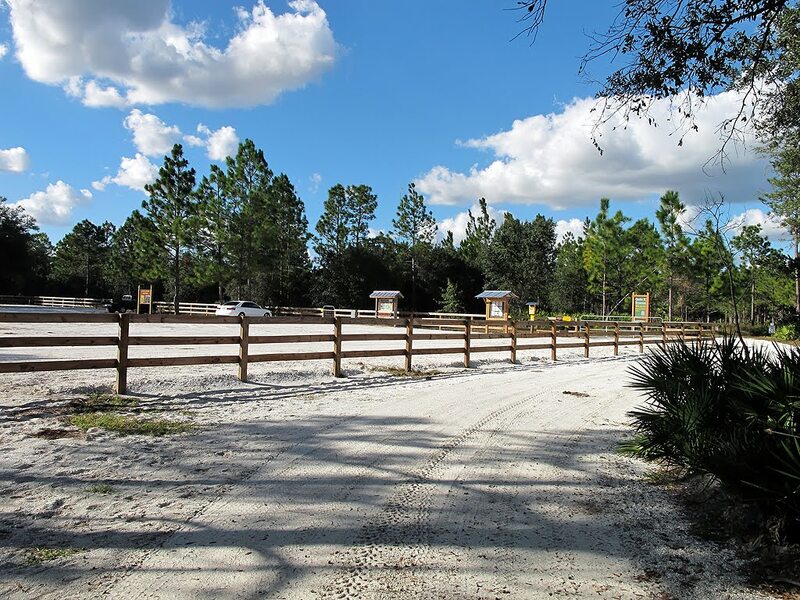 You will encounter just about every species of wildlife that is available in this segment of Florida. Most of the areas can be accessed by hiking or biking. Being an avid hiker, the only tread that hits the pathways I am on is on the soles of my boots. There are a number of very picturesque creeks which cross the property. Bikers and equestrians have miles and miles of roads at their disposal to explore and enjoy. As in all cases, blazed trails are to be only used by foot traffic. As I mentioned, hunting is allowed quite a bit during the winter season. I know I avoid the area during hunting season. Check my WMA Hunting Information Calendar for the current hunting schedule. Embedded in the State Forest are a few private parcels of land; they are well marked, I suggest you stay off private property. I have hiked the area many times, covering up to 13.5 miles during each visit. You can hike for miles and miles (as of this writing, I have hiked over 167 miles). 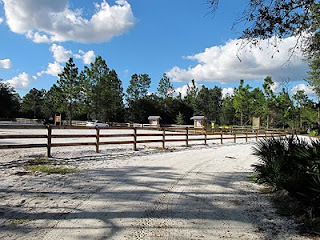 If you decide to wander and not follow the blazed trails it is best to start at the main parking lot at the end of Phillips Road. From there you can head North on road #1 or head East on road #1 (road #1 is a loop, so you could start and end on it). If you head north you can branch off road #1 into one of the large pasture areas. 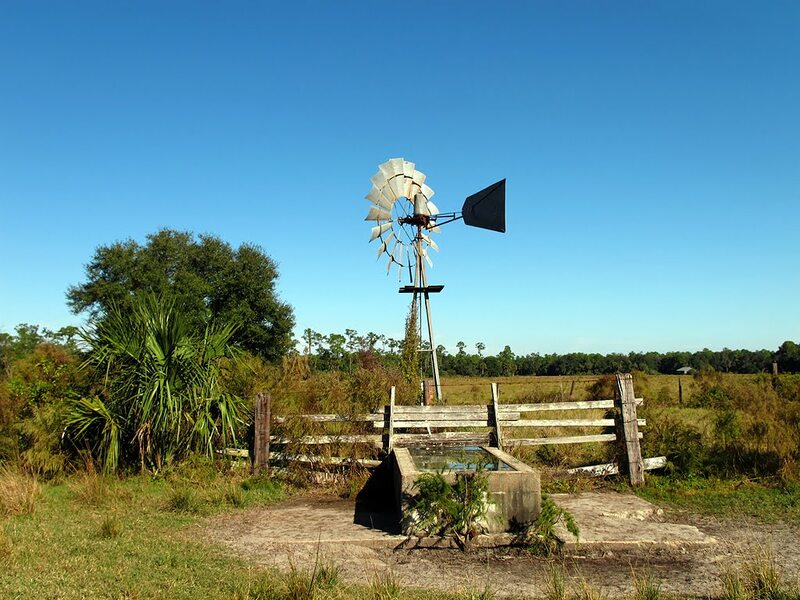 Upon venturing into those areas you will encounter more of the remnants of the old cattle ranch which occupied the area before the State of Florida took over. You will see many cattle feeders, all kinds (wooden, concrete, steel and some new modern ones). There also are a number of windmills positioned throughout the area. These were used to pump water from wells to provide water for the cattle. You also will see different ways that the cattle people handled water in their fields. That included digging small canals, and constructing small dams on some of them to hold the water. If you look around you will see evidence of how the ranchers / farmers utilized American ingenuity to irrigate their fields. There also are a number of artesian wells scattered throughout the property – I’m sure they will be capped someday. You also might see evidence such as large pumps to pump well water and a huge system to pump water from the St Johns River. If you head east from the parking lot and then branch off road #1 you will hit a fence which cuts off the wetlands from cattle wandering. It seems the cattle are restricted from that area. 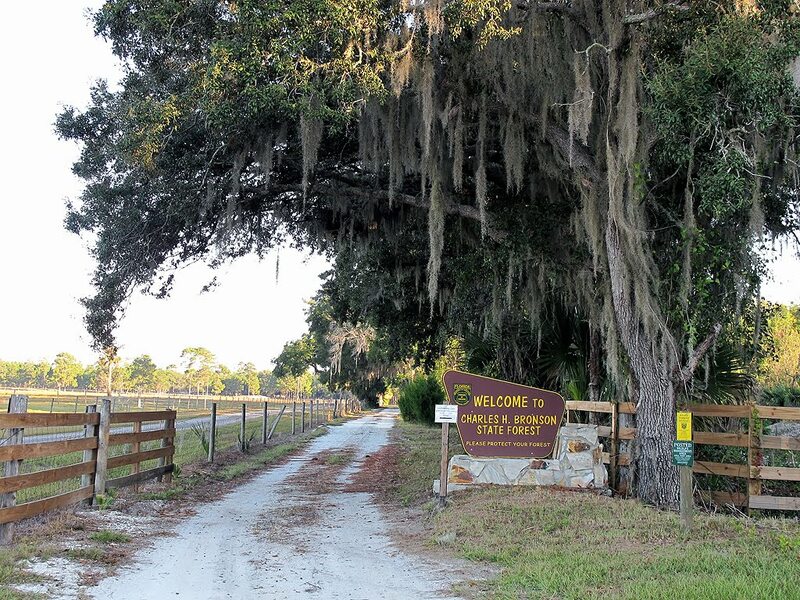 After crossing the gate you will hit a classic Florida wetland area. There are swamps, cypress domes and of course, water. Like much of cultivated Florida, you will see how cattle people built canals to drain some of the wetlands. As you get closer to the St Johns River you should enjoy the wetlands quite a bit. The only problem is of course, water! If you try to enter these areas during the wet season, you will encounter some pretty wet areas. By heading northeast you can work your way out to the St Johns River area. There are some very interesting things to see while wandering around the river area. There once was an extensive dike and canal system near the St Johns River, but the SJRWMD has removed them to restore the river. There are a number of documented Indian mounds that you might like to visit. There also are a number of undocumented mounds which most likely are also Indian mounds. As I mentioned earlier, you will encounter man-made canals all over the place. Most of the canals can be jumped over, but many are so big that getting across during the wet season could be a real challenge. The State has replaced one main bridge which can be used to head into the Northern section of the area (Clonts Tract). As you venture into different areas you will see a number of cedar trees cut down. We did come across an area with sliced cedar wood that was left from a sawmill. There also was an old sawmill saw blade nearby. This looked like a spot where they processed all the cedar trees that were cut down. Also if you look closely in many areas you will see remnants of old time Florida turpentine processing. Turpentine raw materials were extracted from pine trees into red clay pots. I have seen the marked up trees and some pieces of the red clay turpentine pots. In all cases, please do not disturb any historical items or even think of taking anything for a “souvenir”! During my hiking around I did encounter hunters, hikers and even some local landowners. Most everyone seems to be getting along, although the local landowner (who also leased the land for his cattle) had some stories about destruction of the area by some unruly people. Please be sure to protect the land and not abuse anything while you’re out and about. I always try to remember a small plastic shopping bag to use to pick up any litter I might encounter (even I have littered by accident). I believe in the motto, “leave nothing but footprints and take nothing but photos”. The state has provided a large parking area at the end of Phillips Road. There is at least one picnic table available for the public in the parking area. You will find a very informative station in the parking area. The State Forest is a quota hunting area so be cautionary of hunters. Check hunting dates when deciding to go hiking in the area, I suggest that you always consider wearing bright clothes while visiting this State Forest. 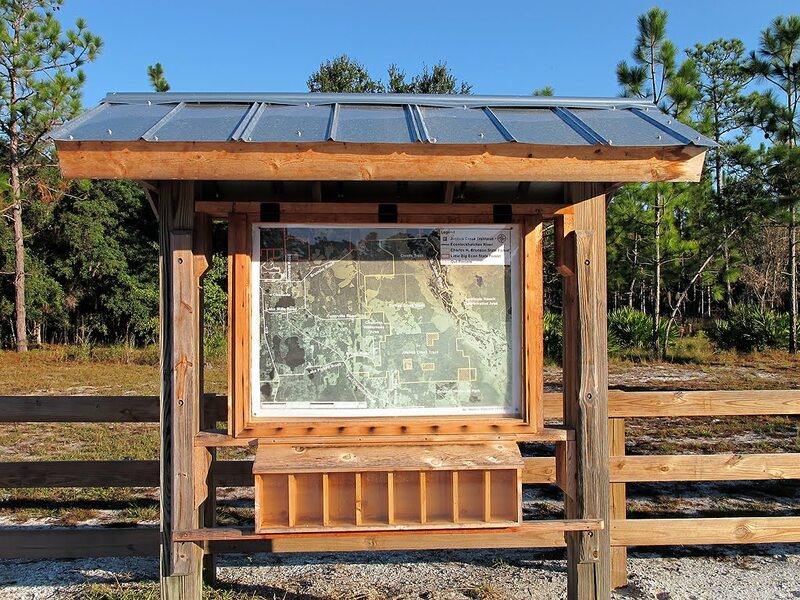 The local FTA chapter, with help from the SCA and other area chapter members, have constructed a beautiful section of the Florida National Scenic Trail System (FNST) which passes through the Joshua Creek Track. 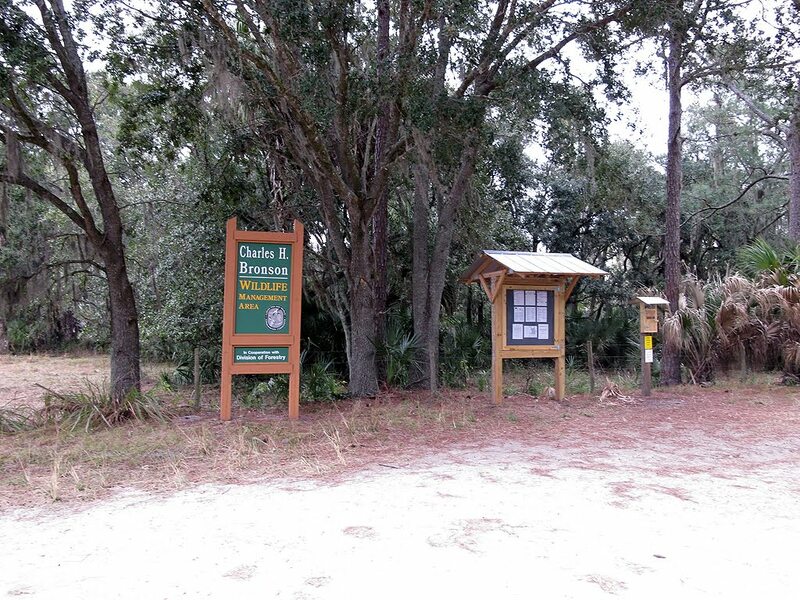 Access points are available from the Seminole Ranch/Orlando Wetlands and Chuluota Wilderness Area. There is an access point at the Phillips Road parking area, that is a short blue blazed connector trail. All trails are very well maintained and blazed. The FTA group and the SCA constructed bridges over major creek crossings and some low water areas to make the trail a little friendlier. I know you will encounter some wet areas during the wet season or after heavy rains, so be aware of that. If you should encounter major water down at the entrance at the Seminole Ranch Conservation area, there is a white blazed trail you can follow which will takes a dryer route, eventually connecting up with the FNST orange trail. They also will be constructing a white blazed loop trail that breaks off and reconnects to the orange blazed trail forming a loop in the Joshua Creek Tract. This will start down at the Orlando Wetlands or from the orange trail up near Chuluota Wilderness Area (blazed blue up there). I suggest you do your homework before attempting these trails, determine where you want to enter and exit them as the distances can add up. 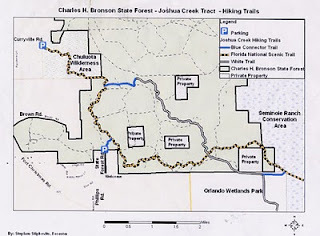 The total length of the trail between Seminole Ranch Conservation Area and Chuluota Wilderness Area is about 8 miles. You also have to hike quite a distance into either of those areas to get to the Joshua Trail. 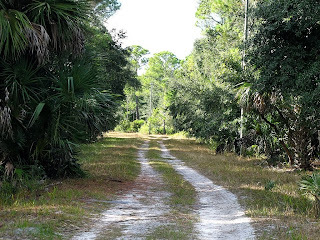 The day we hiked it we used two cars - it would have been a 20 mile hike if we had entered at the Seminole Ranch Conservation Area parking area on Wheeler Road, hiked up and over to the Chuluota Wilderness Area and back. By parking a second car at the Phillips Road Parking area the hike was 11 miles. A certain amount of the marked roads are crossed, so you can exit at different places. Your GPS might be your best friend out there. Remember, the blazed trails are for foot traffic only; no bikes or horses! These trails are a wonderful way to see the area; the creators/workers did a magnificent job! • Private Land – There actually are some private homesteads embedded in the State Forest. These are posted in most cases, be aware of them and stay out of them. Glad to see the old place is finally open for more people to enjoy. My family owned the southern 4000 acres (which was known as "Twin Hickory Hunt Club") with some other people until 2007. If one of the hunting cabins is down on the creek with a huge hickory tree out front and some branded palm trees, that is our old cabin. My great uncle built that back in the 60s. I wish there was a way to keep it up (if it still is). The homestead to the right of the Philips Rd entrance belongs to the Tanner Family, they used to own that half of the forest and still ahve cattle and the two improved pastures you see when you are headed southeast. Needless to say I love that piece of land, I spent years walking every inch of it, nice or nasty. Everyone please treat it well. Thank you for the historical information, always happy to learn more about the area. If anyone else knows more of the history of CHBSF, I would love to hear it. Thanks for another good find. Hiked 8 miles about a month ago. 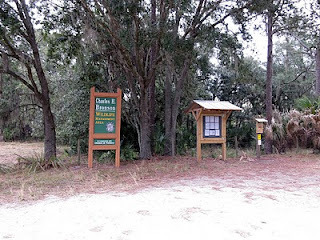 Great hiking trail loops esp. around the creeks. I did get the most ticks I've ever gotten on this hike. Take plenty of water and take a GPS! Highly recommended! My Family still owns land in the middle of the state forest. I grew up spending weekends out in the beautiful forest. We love it and take very good care of it. Terrific hike, vast & varied! Lots of ticks as mentioned above. Also, some cattle started trotting over to "greet" me at one point. Not sure of the intention - one was a large bull - so I kept my head down and pressed on. Tom, what are your thoughts about taking a dog off leash on some of these hikes? Do you see many venemous snakes around? Just wondering the chances of running into a pit viper on some of these hikes. Hi – my thoughts on dogs and leashes - I was recently in the Charles Bronson WMA doing some biking around and did notice a sign stating no dogs allowed without permission, so I guess that should be your first concern. Next, about a dog getting into trouble with some of the wild critters out there, I would say there was a fair chance of it. I have seen every snake, venomous and non-venomous, and have not been attacked by any of them. Unlike us, dogs are curious and thus are more likely to harass a snake and get attached. I don’t have a dog, but if I did I wouldn’t let it wandered away from me, knowing what is out there. I recently ran into a couple of hikers who had photos of a pigmy rattlesnake which was right on the trail they were using. Pigmy rattlesnakes are supposed to be very venomous and I’m sure would kill a dog if it bite it. You also have to be careful that your dog doesn’t go too close to water, as a friend lost his dog to a gator. Many dogs like to chase wild hogs and if they corner one, believe me the hog will win! So, bottom line, if you love your dog you will most likely want to keep it under your control when out there in the wild. My husband and I are planning a backpacking adventure for Alexander Springs to Joshua creek. Are there any primitive campsite near or hotels ?